If you’re familiar with Black children’s book publishing, then you might know why Just Us Books was founded. Parents Wade and Cheryl Hudson were tired of searching for books that featured little brown boys and girls, and coming up with the same handful of titles. So they combined their experience in writing, marketing and art direction and launched Just Us Books in 1988 to publish children’s books that celebrate the diversity of Black history, culture and experiences. From the start the company was dedicated to ensuring that these books would be available throughout the year—not just during Black History Month; to providing a creative venue for talented Black writers, illustrators, designers and other professionals; and most importantly to inspiring, encouraging and educating young people through reading by offering books with characters, stories and themes that reflected their lives as young Black people. Although some in the publishing industry doubted there was a viable market for Black-interest books for children, the Hudsons, other Black parents, and many educators and librarians knew there was. Just Us Books proved it when the company’s first titles, AFRO-BETS ABC Book, AFRO-BETS 123 Book and Book of Black Heroes from A to Z, became top sellers. 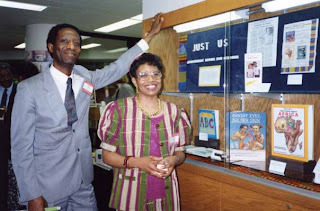 Most of Just Us Books’ early customers were Black parents, teachers, librarians, sorors, church leaders and other community members who saw the Hudsons’ vision and shared their mission. This year, Just Us Books celebrates its 20th anniversary, and we need your support more than ever. The publishing industry and retail climate has changed since 1988. And thanks in part to the Hudsons’ pioneering efforts, more Black-interest books for children are being published and sold. But there’s still a lot more work to do. We still need to ensure that what our young people are reading reflects the diversity of our experiences as a people—not just one aspect of our culture or reinforcements of racial stereotypes. We still have to push for Black-interest books to be included in our classroom curricula, both in majority Black schools and schools with more diverse populations. We need to see more Black children's books on shelves at major retailers, local bookstores, libraries, and homes. We also need to make sure that books that uplift, promote healthy self-esteem, offer hope and positive role models for our young people are available. 3) Ask for our books at your local bookstores. 4) Encourage your schools, churches, libraries and community organizations to buy our books, and participate in our programs including our book fair fund-raisers and author visits. 5) Encourage young people to participate in our programs, such as our new writing contest for elementary school students that celebrates Black fathers and the Million Man March. Twenty years in business is a great accomplishment for any company, particularly a Black owned business. As Wade and Cheryl can attest, the combined efforts of a few people can make a big difference. So please do what you can to support Just Us Books as the company celebrates 20 years of publishing great Black-interest books for all children.